Description: The traditional peanut cactus Echinopsis chamaecereus (a.k.a. 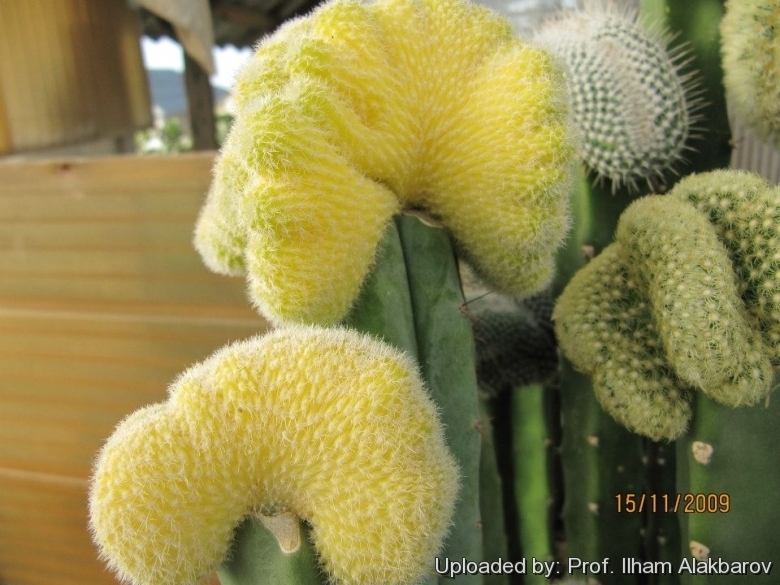 Chamaecereus sylvestris)is a low growing matforming cactus with many crowded finger-like stems. Established plants can reach a height of 15 cm and width of 30 cm, with stems. Forma lutea, aurea or aurata (Yellow form): The schizochromic form (Echinopsis chamaecereus cv. Lutea) has pale yellow stems due to the absence (or reduced production) of chlorophyll pigments: every other pigment is present at normal levels, the dominant green colouration is lost, but will still more than likely have normal other pigments that give the yellow overall appearance of the stem. This plant with yellow stems is very attractive and highly prized. It is almost always seen grafted on stronger columnar species, and cannot can be grown on its own roots. However some clones have enough chlorophyll in their tissues and can be grown on they own roots too, but very slow growing. Crested form: The crested form is a golden-yellow treasure that forms superb brain-shaped mounds up to 20 cm (or more) in diameter with age. Despite to its beauty it is quite rare and sought after by collectors. A real traffic stopper! Stem: Thick, fan shaped, deeply ribbed, yellow. Spines: 10 to 15 soft, white bristles, 2 mm long.